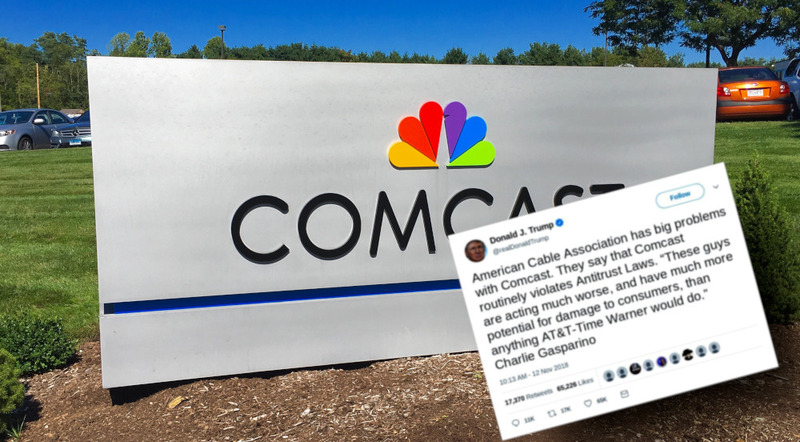 The American Cable Association (ACA) represents 700+ small/medium US cable operators; they've written to the Assistant Attorney General calling for an "immediate" antitrust investigation into Comcast's business practices, a call that was supported by Donald Trump in a tweet. The ACA claims that Comcast's market dominance gives it the potential to get preferential treatment for "must have" channels, and that its past conduct (including violations of its consent decree) put it at a high risk of these abuses (Trump claimed that the abuses were already "routine," which is not what the ACA alleges). Comcast owns NBC, one of the many media companies that Trump has vocally denounced. The Justice Department is currently trying to stop a merger between AT&T and Time Warner, and the ACA strategically argues that Comcast is more dangerous than those companies combined. But the department may already have its sights on Comcast. In August, Delrahim warned Comcast that it would continue monitoring potential antitrust threats even after the consent decree expired. Last month, Delrahim also said the Justice Department would investigate whether Comcast was using its 30 percent share in Hulu to undermine the streaming video service, which competes with traditional cable. The ACA’s letter also raises concerns involving Hulu, suggesting that Comcast could effectively hold the service hostage. “We have heard from ACA members that they fear that ComcastNBCU may restrict, if it is not already restricting, their ability to access Hulu and make it available to their customers as an alternative to their cable offerings,” reads the letter. (Hulu is generally found on the web, but cable operators can add it as a “channel” for more traditional TV viewing.) However, Comcast only holds a minority share in Hulu, and it will have even less influence after a Disney-Fox merger gives Disney control over 60 percent of the service.